On Wednesday, September 13, University of Maryland (UMD) faculty and staff gathered in the Memorial Chapel at convocation to usher in the new academic year with a celebration of achievements across campus. 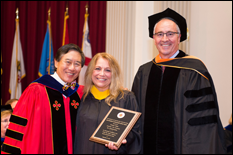 At the ceremony, the UMD Division of Research Associate Vice President for Research Administration Denise Clark received the prestigious President’s Distinguished Service Award for her tireless efforts and dedication to the university and to the Division of Research. Clark joined UMD in 2007 to lead the Office of Research Administration, a role in which she has excelled for ten years. She has organized and led innumerable workshops, conferences and other training opportunities to educate the research community on how to tackle the challenges of federal funding, compliance, and policy, which has facilitated and enhanced research on campus. She has also taken over management of Sponsored Programs Accounting and Compliance to improve coordination between the former pre- and post-awards offices. Clark is well known across campus for her astute problem-solving ability, and for fostering collegiality between researchers and research administrators. Clark also has worked closely with the University of Maryland, Baltimore (UMB) on the MPowering the State partnership between UMD and UMB. “Denise champions collaboration—a vital aspect of our working relationship between the two universities—enabling our research to have a profound effect on our productivity, on the economy, and on the very fabric of higher education,” says Bruce Jarrell, M.D., senior vice president and chief academic and research officer at UMB. Clark also has recently worked to increase UMD’s international reputation through the Borderless Research Administration Knowledge Exchange (BRAKE) initiative and recently returned from a visit to Australia in which she introduced research administrators at the University of Melbourne and Australian National University, Canberra to US regulations to clear a path for the university’s principal investigators to collaborate with experts in their fields from across the world. “She has helped to put UMD on the international map as a leader in research,” says College of Behavioral and Social Sciences Assistant Dean Ann M. Holmes. The President’s Distinguished Service Award was established in 1996 to honor university staff who have served the university for at least ten years and have demonstrated exceptional leadership and performance. Recipients of the award have a record of exemplary performance and distinctive contributions to the operation of an administrative, academic, research, or service unit on campus. They have clearly demonstrated initiative toward the improvement of University programs or campus activities and have shown commitment to the campus community as a whole.